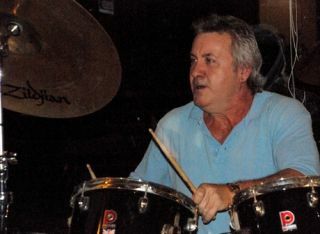 The drum world was shocked last month to learn of Robbie France's passing. France built a successful career for himself playing for the likes of Diamond Head and UFO. But, it is his contribution to Skunk Anansie that many will remember him most fondly for. In memory of Robbie's career behind the kit we've pulled this interview which finds him talking about one of Skunk Anansie's biggest hits out of the vaults. "I used to get into the studio really early and set all of the equipment up for the band. This morning Ace [guitar] came in early and we set out on a jam session. We were mucking around and he came up with this riff and we went, 'Woah, that sounds pretty cool'. The drums and guitar were written in an hour, if that. "It came together really fast. Skin [vocals] came in and she had lyrics. We wrote the song in a matter of hours and it was just a magic moment. It was one of those moments when everything fits into place. I think we all realised that it was a really strong song at the time." "We did pre-production at John Henry Studios in London. I was really stoked about the whole album. I was 34 at the time and I'd done a lot of music and it was one of those that I thought was going to be an absolute little belter. It was one of the best sessions I've ever done in my life. It was one of the best periods of my life. I've been in the studio since I was 13 years old and as soon as my tracks were done I was out of there! I used to do my parts and then go to the pub." What kind of drum sound were you going for? "I just wanted a deep, rich sound." What kit did you use on the track? "The kit I used was a Sleishman, which is like the Rolls Royce of drums, very expensive. Don Sleishman gave me a kit to bring to Europe to promote the company. The kit was actually on Tomorrow's World! It's the best kit I've ever played. None of the fittings touched the shells. The way Don set up the kit was just the most pure sound you've ever heard on a set of drums. To play a set of those is like if you're an F3 driver, stepping onto the F1 circuit." "I've been with Zildjin for 36 years now and I still use the massive ride cymbal that I used for my weekend gigs. I've had the same cymbal set for so long now, they're amazing." What are your thoughts on the song now? "It's a pleasure and a privilege to be associated with such an iconic piece of music. We all played our part in writing it. I still get pulled up in the street now to this day. People of an age come up and say what the song meant to them in the '90s and what it means to them now. It's just a really special piece of music."